Seville: Skip-the-Line Alcazar Ticket. 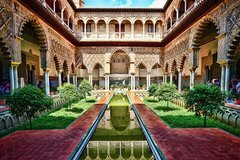 Marvel at the stunning Islamic architecture of the Alcazar. Skip the long lines waiting to enter one of Seville’s most popular monuments. Duración: 1 to 4 hours.